Ideal for indoor or outdoor entertainment such as watching movies and football games with super rich colors and clear images in dark night, in courtyard at dark circumstance. 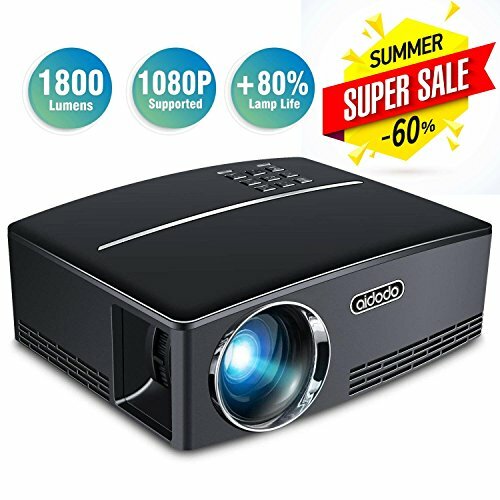 AFFORDABLE 1800 LUMENS LED MINI PROJECTOR: This smart-looking projector is brighter and sharper than other similar projectors on the market, making it your first choice in home entertainment. This projector will provide you with an excellent home cinema experience. PLEASE NOTE, as this is a home entertainment projector, we do not recommend it for PPTs or business presentations. MULTIMEDIA CONNECTION: Easily connect any TV Laptop DVD Player and HD Games with an HDMI or USB SD Card VGA AV. LEADING WARRANTY: We're so confident of the quality of our product that we provide a 3-YEAR warranty and professional customer service & technical support. If you have any problem or question, please contact us anytime! If you have any questions about this product by Aidodo, contact us by completing and submitting the form below. If you are looking for a specif part number, please include it with your message.